Benedito Granado Pereira (1908-1988): Pharmacist, writer, poet and great propagator of education as a source of a country's growth and reduction of social inequality. 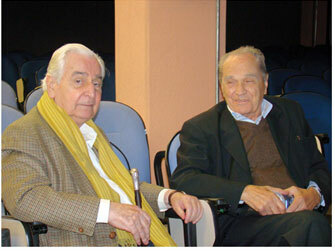 Antônio de Souza Teixeira Junior (1921 - 2013): Physicist, teacher, educator. He wrote textbooks on physics teaching, and he was the last director of the Brazilian Foundation for the Development of Science Teaching (FUNBEC), which produced didactic materials in the 1970s, highlighting the series "The Scientists".He was Vice-Rector and Rector of the Universidade do Vale do Paraiba (University of Vale do Paraiba), a great supporter of entrepreneurship and resposible for the establishment of business incubators in the University. George Jonas (1930-2012): Born in Hungary, he majored in Chemistry with a specialization in Photochemistry. He was a pioneer entrepreneur in the photographic industry in Brazil, being a filmmaker, science teaching film producer, documentary producer and founder of one of the largest advertising agencies of the 70s and 80s, the Espiral.